A man tries to face his greatest fear. His own reflection. Jack can’t look at his reflection in a mirror as he believes his reflection has the life of its own. Once, his friend Sam leaves Jack alone in a public restroom. Jack has to face his fear as he needs to go past the dreaded mirror. A man named Francis relates a story about his best friend Alan and his fiancée Jane. 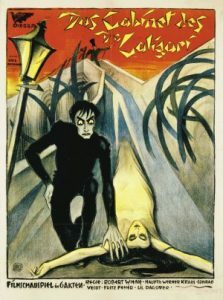 Alan takes him to a fair where they meet Dr. Caligari, who exhibits a somnambulist, Cesare, that can predict the future. When Alan asks how long he has to live, Cesare says he has until dawn. The prophecy comes to pass, as Alan is murdered, and Cesare is a prime suspect. Cesare creeps into Jane’s bedroom and abducts her, running from the townspeople and finally dying of exhaustion. Meanwhile, the police discover a dummy in Cesare’s cabinet, while Caligari flees. Francis tracks Caligari to a mental asylum. He is the director! Or is he? Below – for your Thanksgiving-reading pleasure – please find Danny’s scoresheet for Red Light. (Please note: for this posting, we’ve broken with tradition and redacted the actual coverage notes.) TRUST US: Danny’s notes – as always – were insightful and detailed; an invaluable read. But we’re allergic to spoilers here at STS. So we’re keeping THAT under our Turkey table today! But a Strong Consider from No Bullscript? You better damned well grab this gem while you can! 🙂 Contact writer Chris at cshamburger “AT” live dot com for a copy of the script! LOGLINE: When three teens challenge a local ghost story by running a red light, they find themselves the next targets of a seemingly supernatural entity bent on revenge but the truth behind the legend may be even more deadly. Narration. Voice-over. For some, it’s a film gimmick that grates on the nerves. But when done right, it can be spectacular. Don’t believe us? Try on a few of these films on for size. Annie Hall: stand-up comedian Alvy Singer recounts his neurotic, titular love affair. Goodfellas: Henry Hill describes his evolution from small time crook to valued Mobster, and fall from grace to Informant. The Usual Suspects: Roger “Verbal” Kint weaves a tale of five random members from a police line-up, and the evil Keyser Soze. Speaking of Kevin Spacey and voiceovers, what about American Beauty? All classic films told through the eyes of the narrator. And that’s the power of “V.O”. In the hands of a skilled screen writer, the voice of the narrator can lift a film to new heights. Add complex dimension to a story, and set the proper tone from page One… whether it be comedic, dramatic, or – in the case of Heart of Coal – downright chilling. Stylishly written and streamlined, Heart of Coal is a deliciously demented script. And an amazing showcase for a thirtyish actress with just the right voice. With the right cast and smart editing, this script is an amazing find. Do this one right, and create a true horror masterpiece! About the reviewer: David M Troop resumed writing in 2011 after a twenty-five year hiatus. Since then, he has written about 50 short scripts, two of which have been produced. Dave would like to make it three. He is a regular, award-winning contributor to MoviePoet.com. Born on the mean streets of Reading, PA, Dave now resides in Schuylkill Haven with his wife Jodi and their two lazy dogs Max and Mattie. He can be reached at dtroop506 “AT” gmail. Chris Sparling, writer of Buried, has written and directed a new horror film, The Atticus Institute. The Atticus Institute is available on demand, DVD, and Blu-ray Jan. 20. Deets to follow. Entries (RSS) and Comments (RSS) | 74 queries. 0.392 seconds.